We are currently in Berlin on a short break, but we are gutted to be missing the launch party tonight in London for Brooklyn's finest, street artist and collagist Bäst. Botulism, is his first solo exhibition with Lazarides Gallery at the Rathbone Gallery and Bäst will present a collection of new works, developing past preoccupations in an exciting new direction. 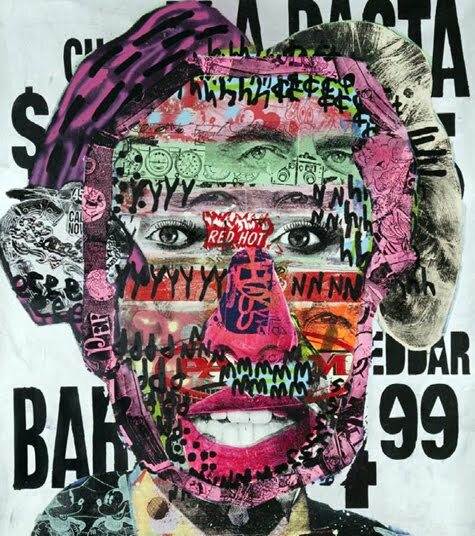 Bäst’s work is inspired by the early punk flyers of London and New York, playing with a variety of 21st Century icons and appropriating imagery from a variety of media. From advertising to comic book characters, Bäst subverts the familiar and recognisable into distorted counterparts. His collages, wheat-pasted posters and paintings morph Mickey Mouse, Pinocchio and Papa Smurf into multi-eyed sexually charged portraits of their former selves. Food packaging, 50’s newspaper clippings and brand logo’s all feature as the backdrop to his vibrant, brilliantly coloured works. Whether appearing in the doorways of downtown New York or on the walls of a gallery, Bäst’s graphic language translates into prints, paintings, collages and mixed media sculptures. His latest acrylic paintings on wood have developed the colourful repetitive patterns so often present in his collages. For Botulism expect myriad unprecedented works with that classic Bäst flavour. Botulism will open to the public on the 20 August and run until the 30 September.The gallery is open Tuesday — Friday 11am - 7pm and Saturday 12pm - 5pm, admission free.